For anyone looking to make healthier food choices or spending less on pre-prepped and prepackaged foods, grinding your meat at home should be one of the first changes to make. Not only can you control the cuts of meat you use to decrease fat content and keep costs down, but you can be sure that there are no additives to keep store bought ground meat fresh for longer. To grind meat at home you need a meat grinder and you can choose from a manual one, or make life easier and choose an electric one. If the latter is your choice, then our best electric meat grinder reviews that follow will help you figure out the best one to buy for your needs and budget. When looking for the best electric meat grinder for home use, there are a few things to consider. If you think you’ll use it to make only small batches of ground meat for the family once in a while, you can keep to a low budget of under $100. Grinder size for this kind of job (determined by the grinder plates) can be #5 or #8. If you already have a stand mixer that offers optional attachments for various additional jobs, check to see if one such attachment is a meat grinder. You can save money and space by going that route. However, if cost is a concern, and you plan to only grind small amounts at a time, you may be able to physically hand crank a grinder and get good results if you buy a quality manual one. If you regularly grind lots of meat, especially sinuous types, or meat that has some bones in it, or want to grind for pet food, then you must consider meat grinders for home use that are very similar to commercial ones. This grinder size should be at least a #12. The parts should be made of metal rather than plastic and the motor has to be higher rated and less likely to overheat. Follow along for our top picks of best home meat grinder options of the electric variety! Click here for even more electric meat grinders rated 4 stars or more. For best results, most meat grinders work better if fresh meat is firmed up a bit by placing it in the freezer for about half an hour. This makes feeding it into the chute easy and the cutting plates cut through the meat neatly. The LEM .75 HP Electric Meat Grinder might be down on some total horsepower when compared to the big boys, but that doesn’t mean it cannot grind with the best of them, as it is a size 12 grinder. It is rated to grind 360 pounds of meat per hour, and although not a commercially rated grinder, it is on par with the better commercial models. This is an all stainless steel model, and even though it should be hand washed, you can put the parts in the dishwasher once in a while. It comes with two augers, 3 stuffing tubes for sausages, a poly pusher, 3 plates for fine, medium and sausage stuffing, and an overall 2 year warranty. You can also order an optional coarse 1/2″ plate if you need it. Metal gears and roller bearings make this a very durable and hard working grinder, it weighs nearly 50 pounds so it will stay put on your counter or table, and comes with an overload breaker for maximum safety and to keep the motor from burning out. Granted, this is not an inexpensive grinder, but this is one of, if not the best grinder in its class. Weston makes 3 sizes of grinders for home use and they’re all good. The Weston No. 22 Commercial Meat Grinder is a genuine commercial grinder that you can get for your home. The 1 horsepower motor grinds up to 750 pounds of meat per hour, and the permanently lubricated motor with the gears revolving in an oil bath means you can expect this grinder to last a lifetime no matter how much you grind. It can be used for all kinds of game meat. At 60 pounds, this grinder won’t move when placed on a counter or table, but moving it around is relatively easy because of the built-in handle. You’ll get 3 different sized sausage stuffer funnels, a stainless steel knife, heavy duty stomper, and you’ll even get a snack stick (10mm) stuffer too that comes with its own specialized auger. It comes with 2 plates, a coarse and a fine. The all stainless exterior makes wiping it down a breeze, and the accessories are dishwasher safe. It comes with a breaker if there is an overload, and it is all covered by a 1 year warranty. 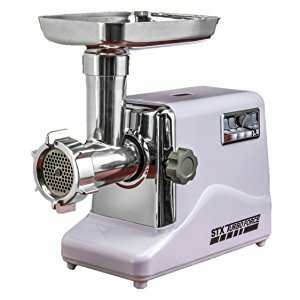 This is the most expensive meat grinder on this list, but if you are in a commercial setting or you grind up hundreds of pounds of meat at a time, this is a viable choice. For a less expensive Weston, choose the #12 (.75 hp) or #8 (.5 hp), which are perfectly good for less intensive use and smaller quantities at a time, but be aware that these don’t come with the hand guard or the reverse function and the warranty will not cover grinding raw pet food. The STX International STX-3000-TF Turboforce gives you features that others don’t, and if you like gadgets, you’ll love this little grinder. And yes, it is a little grinder with a weight of about 12 pounds, so even though it comes with rubber legs that will help grip and surface it is on, you’ll have to be careful to keep it from moving around much, especially if you are grinding large pieces of meat. However, the grinder head size is not small by any means. It is a #12! The 3 speeds give you a grinding versatility unlike any of the others, with high speed grinding allowing you to grind up to 225 pounds per hour and the lowest speed up to 140 pounds per hour. The reverse speed allows you to unplug anything that gets stuck inside. The motor is rated at about 2/3 horsepower and it is fan cooled. The accessories include 3 different cutting blades, 3 different grinding plates, 3 different sized sausage stuffers with an adapter, and it even comes with a Kubbe attachment. It features the best warranty on this list with a 3 year 100% replacement warranty. There are a few things to consider when using this grinder. The gears are made of poly plastic so they are not going to hold up to incredibly heavy duty grinding, and if forced to grind things like bones or tough grit, the gears may chip. Also, when used continuously, it may overheat and throw the inboard breaker switch. That being said, for light duty to medium grinding and sausage stuffing, and with a competitive price, it is a good deal on a versatile and functional meat grinder. If you are looking for the best bang for the buck meat grinder, you’ve just found it in the Kitchener #12 Electric Meat Grinder. The ½ horsepower motor is durable enough to do all of your medium grinding chores, and this is one of the lower cost grinders on the list. It is a single speed with a reverse function if the auger jams up, and there is a built in breaker so that the motor won’t overheat. You’ll be able to grind 176 pounds of meat per hour, and the motor is fan cooled. Accessories include 3 sausage stuffers, an adapter, stainless steel knife, meat pusher and a Kubbe stuffer too. You’ll also get coarse, medium and fine plates, and a 1 year limited warranty. It weights about 14 pounds, so you’ll need to be careful stuffing meat into the grinding throat, no large loads or the grinder may move around a bit. You must hand wash this unit and the accessories because some of the parts are made of aluminum and the dishwasher may damage the finish. Also, the user manual gives very rudimentary instructions, which may not be a problem if you know, understand and have used grinders in the past. But really, for basic everyday grinding tasks, the ½ horsepower is up to the task, and the grinder will get the job done. As long as you’re not looking to grind bones with your meat, this 800 watts Gourmia GMG7000 will do every job for you easily. It’s a relative newcomer to the market but customers so far love its performance and stability because it can even handle lots of deer and venison cut up into small chunks in one go and won’t jump about on the counter or overheat. Everything is made of metal – stainless steel for the three cutting plates and cast aluminum for the rest. The only plastic parts are the three sausage attachments and one kibbeh attachment. It is easy to use, with a 3-way switch to turn it off, reverse, and turn it off. A lock for the gears ensures safe operation. The horse power is rated 0.67-1.34 and the warranty is good for 1 year. The parts are easy to assemble and put back together and are easy to wash by hand but should not be cleaned in a dishwasher or the non-stainless steel parts will be ruined. The Sunmile SM-G31 Electric Meat Grinder is rated at 1 horsepower, but the reality is that the motor is closer to a continuous ¼ horsepower, so don’t be confused by the rating. That being said, it will work well for lighter and medium grinding tasks. It is a very simple to use grinder, with just an on and off switch as the only control functions. It comes with 3 different sized sausage stuffers, 3 different sized stainless grinding plates, a poly pusher and 1 cutting blade. This is the second least expensive grinder on this list, and although it will do a credible job grinding if not pushed, there are some things to consider. The weight is sightly more than 7 pounds, so when grinding and to keep it in place, you’ll have to use smaller pieces of meat to insert into the grinding throat. It isn’t made for heavy duty use and the design is such that raw meat juices have a tendency to run backwards into the motor compartment. It is rated at 150 pounds of meat per hour, but if you attempt that amount, you will most likely overload the motor. It is not dishwasher safe, so only hand washing will do. The warranty is 1 year limited, and customer service is sketchy, at best. If you have a KitchenAid mixer you already know how versatile they can be with all kinds of attachments that fit on its head to carry out numerous more tasks than just mixing. One of the tasks that you can use a KitchenAid Mixer’s motor and head for is meat grinding. Just buy a compatible attachment and you’re good to go. One of the attachments is the Chef’s Choice Premium Metal Food Grinder Attachment. Since you will be using the motor of the KitchenAid mixer, you’ll only get the actual grinder body with grinder plates and cutter and no other accessories, but the standard KitchenAid accessories will work on this unit without a problem. You can choose to buy the 2 piece model that comes with a coarse and medium grinder plate, or the 3 piece model that also has a fine plate. It’s solid metal except for the pusher, which is relatively thin plastic, so you won’t be able to push very hard or it may crack. If you want to stay with the brand, you’ll have to get the KitchenAid Meat Grinder attachment that includes a sausage stuffer and food tray. It is made of heavy duty plastic, and unlike every other grinder on this list, it is fully dishwasher safe. Of course you will need the KitchenAid mixer base to use this, and if you are partial to a metal grinder, this won’t do. But for light duty grinding of meat and other foods, this attachment works well. What is truly best for you is knowing exactly what you want in a meat grinder. If you own a commercial business, then the only real choice is the Weston. If you are a hunter, get your beef by the side or perhaps a small business with limited heavy duty grinding, than you’ll be good to go with the LEM grinder or any of the smaller Weston grinders. For the money, the best is the Kitchener. It can handle limited heavy duty grinding and will most likely satisfy everyone’s basic ground meat needs. For lighter duty grinding in a very inexpensive package, choose the Gourmia. The Sunmile is also good but it has its quirks. Finally, if you have a KitchenAid mixer, any one of the two attachments will work for light grinding. The genuine KitchenAid grinder is made of plastic, but if you want metal, the Chef’s Choice is your only option. They will both make equally good accounts of themselves.